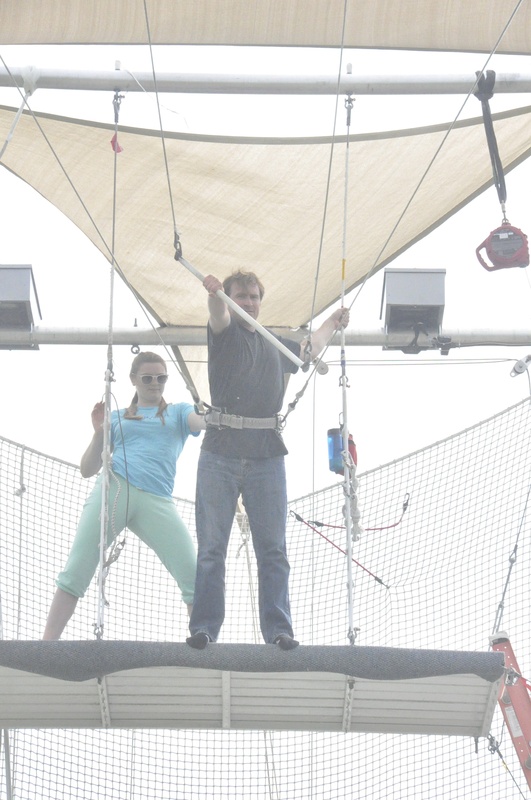 Two weekends ago, Stephen and I took a trapeze lesson. I had signed us up earlier this year – a $40 Groupon, so why not? Months passed, and we finally found ourselves at the lake front starring at a steep ladder, a couple swinging bars, and a catching net. We laughed. What the hell are we doing? Yet we parked the car. 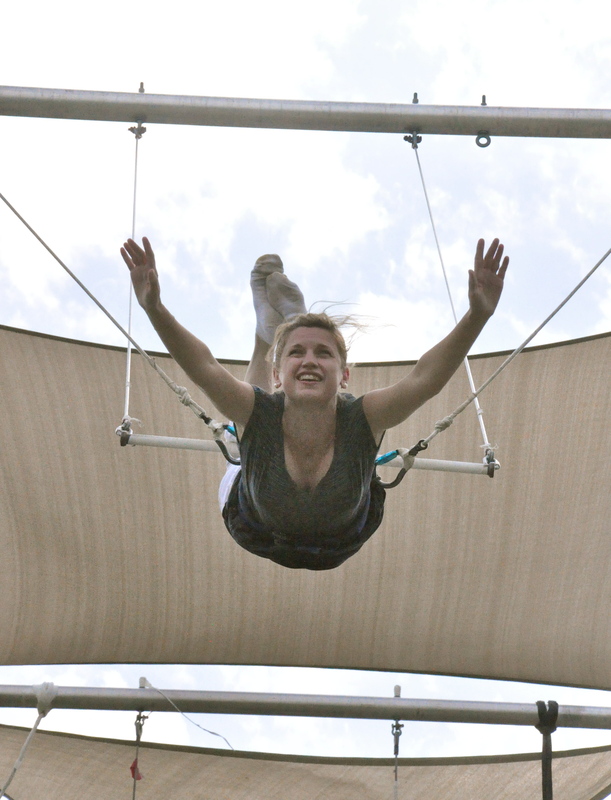 Trapeze School New York has several facilities across the country, which specialize in flying trapeze. In Chicago, there are two options – indoors or outdoors. We went with the view of Lake Michigan at the outdoor location at Belmont Harbor. We walked up the grass toward the lake front, signed a waiver for our lives, and were asked to take off our wedding rings. Foreboding? Then our instructor, Rooney, started to melt my fears as he warmly greeted us and harnessed us snugly around our waists. Rooney lined up the newbies and taught us to reach for the trapeze one hand at a time – first right, then left. A quick lesson and up we went! The platform looked high and I was leery, but I reminded myself one rung at time. As I climbed to the top, I was a lot less scared than I thought I’d be. At the top of the ladder, I lifted myself onto the platform, loaded chalk on my hands in hopes it would glue me to the swinging bar, and prepared myself for lift off. 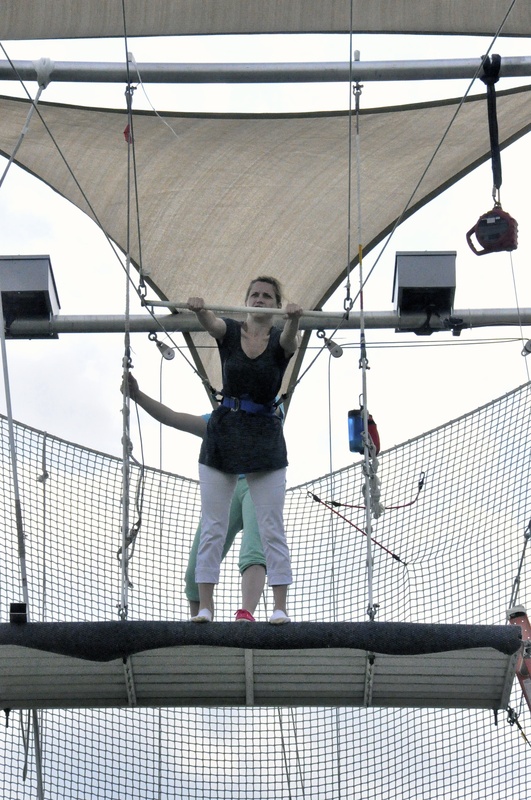 I was instructed to put my hands on the trapeze, press my shoulders back, and lean forward while an instructor held my body in ready position. Stephen looked confident, ready to conquer the trapeze. He went first and I was thankful for that. 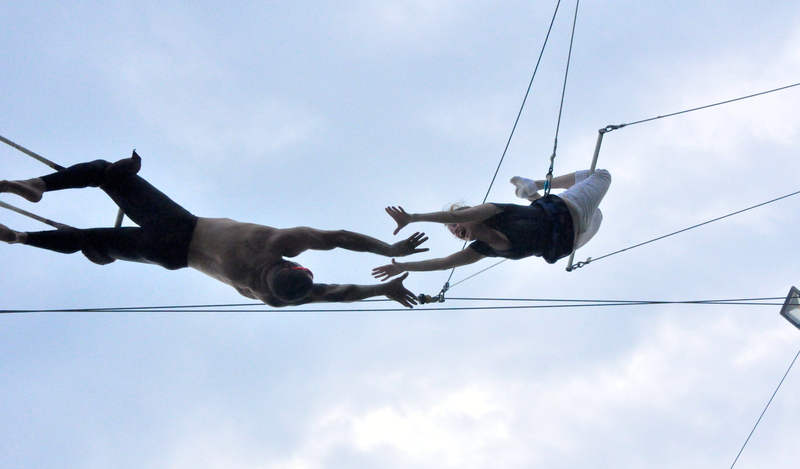 I was surprised by how heavy the trapeze felt – it felt like I was being pulled off the platform. I was not certain my arms could hold on. It helped that the boy in front of me froze at the top and could.not.let.go. I snapped into mommy mode and showed the nine year old that if I could do it, he could. Here’s a video of my first time flying. Suggestions: Wear flexible pants. My white pants weren’t the best for the job. I kept thinking I was giving a plumber to the group below. Swing, swing, swing … and crack. Oops. Have fun and listen for the calls. You’re harnessed in, so let go of resistance and follow the instructor’s commands as you glide through the air. There’s a team member holding the ropes on the ground. He’s watching you fly and timing your actions. Listen for his/her cue to bring swing your legs back and forth, to pull your legs up over the bar, to reach, to let go, to flip. His vantage points offers the precise moment to go. Take action when you’re told and you’ll succeed. We both made it to the second level – getting caught by the super buff instructor, Rooney. I listened for the call – Hep! – and let go. Here’s the video of me getting caught. Then a summer storm rolled in, changing the atmosphere from fun in the sun to are we going to get offed by lightening? We escaped to Carriage House where I had my first fried green tomato. Me likey! 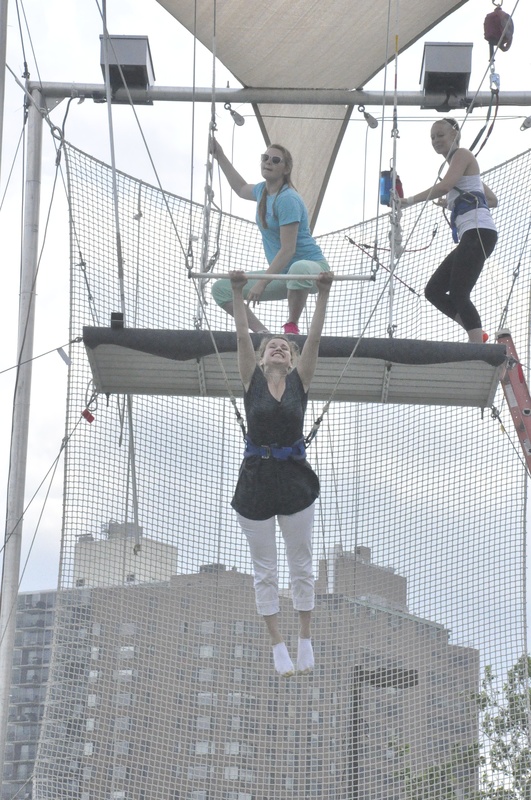 Would you take a trapeze lesson? It was a hilarious and bonding date night. Do you have any other quirky or thrilling date-night ideas? I’m itching for more! P.S. A Logan Square date night. I LOVE Parsons! I have always wanted to do that!! What a fun date! Go for it! It was fun, not as scary as I thought.